Choosing a perfect home project is the one of the most important decisions. Using many years of experience and knowledge of highly qualified consultants – Extradom – tends to cover individual needs of Investors. Willing to satisfy every customer in their offer they propose over 16 thousand house projects, and also an ability to customize the projects for free. As the only one office in Poland, they give to customer a possibility to analyze building plot and checking chosen project in a 3D Creator. Additionally Extradom values time and money of investors, that is why they offer the lowest prices and packages of worthful additions that are very useful during the house-building process. Extradom helps not only with the choice of house but also on every stage of construction. Cooperating with the companies from all over the country, the client can count on full support with project implementation and with finding proper materials and specialists. 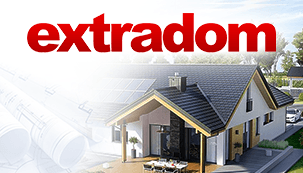 What is more, our client created “My Extradom” community, where investors can exchange experiences and advices necessary to make good building decisions on every step of construction plan. On choosing house project step, investors pay a key attention also to the environment. That is why in the offer we can find such landscape design projects as barbecue garden houses, ponds, garages or farm buildings. Comprehensive and individual approach of Extradom to its clients supply of services on the highest level and let for effective cooperation with customers. The group of satisfied clients is still growing and every accomplished project is a proof for reliably work.